After undergoing gall bladder surgery at the age of 23, Jennette Fulda, who weighed 372 pounds at the time, realized that obesity was threatening her life, so she vowed to lose weight. 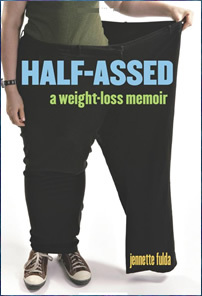 In her book, Half Assed, she recounts what it was like for her being morbidly obese and writes about how she was able to lose over 200 pounds, without losing her sense of humor. This is not a traditional dieting program but is instead a memoir of Fulda’s personal weight loss journey and the insights and experiences that occurred for her during the process. She doesn’t outline a specific diet or offer a meal plan in the book but encourages a back-to-basics approach, emphasizing healthy eating and regular exercise. Fulda believes the most important thing is to look at a diet not as a strict regime, but as something you want to do. So it doesn’t matter what specific diet you choose, as long as you are enjoying yourself. She learned that it was important to avoid getting hungry and cutting calories too low, because this cannot be maintained over the long term. She advises readers that if you always make sure you have healthy snacks available, you will be less likely to be tempted by foods that are not supportive of your goals. Throughout the book Fulda outlines some of the positive changes that she noticed as she was consistent with healthy eating and regular exercise. She says, “All this healthy living was starting to make me feel alive. I’d never even realized I was half-dead.” She discovered that she actually really enjoyed cooking and getting in shape, and that the biggest reward was all of the new things she could do because of her improved fitness and health. Spinach, broccoli, lettuce, celery, eggplant, apples, oranges, bananas, star fruit, mango, fat free yogurt, string cheese, ricotta cheese, chicken breast, turkey, oatmeal, whole wheat bread, flax seeds, Lean Cuisine meals, diet soda. This book does not include a sample meal plan. Fulda started to exercise by walking just a few minutes a day on a treadmill in her house because she was too embarrassed to exercise outside. Now she actually likes working out and enjoys running outdoors and doing Pilates. She says initially her goal was to lose weight but now she is focused more on living an active life. She encourages you to find an activity that you love to do such as cycling, rollerblading, tennis or basketball, because if you enjoy being physically active you are more likely to keep it up as part of your regular routine. Half Assed: A Weight-Loss Memoir retails at $15.95. Takes a humorous approach to losing weight. Discourages fad-dieting and yo-yo dieting. Many readers will find inspiration in the author’s story. Advocates a healthy lifestyle approach to weight loss. Does not include a diet or exercise plans. Nutrition and food suggestions are not included. Many dieters will require more guidance to successfully lose weight. Half Assed is a weight loss memoir that takes an honest and humorous approach to the author’s challenges and self-discoveries in her process of losing weight. It will appeal to readers looking for insight and inspiration for their own weight loss journey.